Please click the NEWS link to see the latest information regarding Rinpoche’s travel, teaching and practice schedule. Today, Lama Wangdu Rinpoche is the Abbot of Pal Gyi Langkor Jangsem Kunga Ling Monastery in Boudha, Nepal, which he founded in 2000, and a well-known teacher and healer. He spends part of each year in Portland, Oregon, USA teaching and leading retreats and the rest of the year training monastics at Pal Gyi Ling in Nepal. 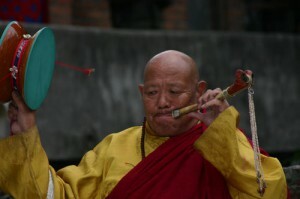 Rinpoche’s style is, in the yogic tradition, simple and direct. Though he often teaches by telling stories of yogis and yoginis, he encourages people to focus on practice rather than discussion and his retreats reflect his confidence in experiential realization. 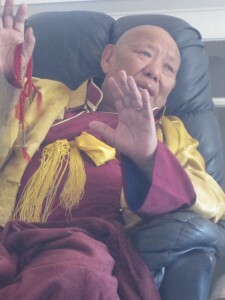 Chod is RInpoche’s heart practice. He received the empowerment to practice Chod soon after meeting Naptra RInpoche and spent many years practicing in retreat in Nepal and Tibet. Machik Labdron and Padampa Sangye, the founders of this tradition, lived and practiced in the same valleys and mountains and left behind a rich tradition that he now holds. The attitude that must be taken for Chod practice is non-attachment to all things and possessions. The feeling should be as in someone who is nauseous from an illness and is then offered food. Such desirelessness must be cultivated. The capacity and understanding to cut through ego-clinging must be developed. As the practitioner sets out to practice, he or she should have no mundane, worldly concerns in his mind. Rather the attitude should be one of extraordinary intention seeking enlightenment for oneself and all sentient beings. With that kind of love and compassion, the practitioner goes [into practicing] with the intention of giving material and spiritual benefit to all beings. Phowa, is the close companion of Chod. It is another way to train in giving up attachment to one’s life and is especially helpful when approaching the moment of death. With the proper training and extensive practice, Phowa can be practiced for oneself or others to help the transition from this life. Rinpoche often gives the empowerment and teachings on Phowa alongside Chod and encourages practitioners to take up both methods for working with ego-clinging. RInpoche has freely offered Chod and Phowa teachings for many years. As a result, countless people from around the world have acquired the means to free themselves from the hope and fear of worldly life and be of benefit to others. This website is dedicated to supporting his teaching, practice and preservation of Chod, Phowa and the lineages that he holds. On this website, you can learn more about Lama Wangdu Rinpoche, his teaching schedule in the United States, and Pal Gyi Ling Monastery. You can also subscribe to receive updates on his schedule, make a donation and learn more about the traditions that he teaches.